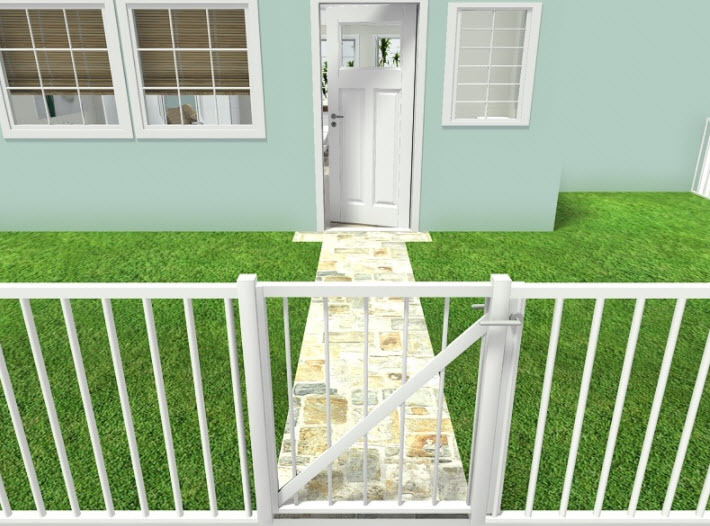 RoomSketcher includes a selection of beautiful garden gates that you can add to a fence in your garden or Site Plan. This article describes the steps when using the RoomSketcher App on a computer or tablet. To add a garden gate, first, draw the perimeter area for the railing/fence, leaving a space for the gate. Next, add the railing/fence, and finally, add the gate. Here are the detailed steps. In the RoomSketcher App, open Walls mode (click the red Mode button and click Walls). Use Draw Divider Line to draw the location for the garden fence. If you need more detailed instructions, see Draw the Perimeter in Create a 3D Site Plan. Draw two short divider lines to mark either end of where the gate will be located. Note: Most of the gates have a default width of about 85 cm (33 in), so place your divider lines at least that far apart. Or, if you plan to change the gate width to a custom size, place the marks that distance apart. Remember, divider lines are invisible, so they will not be seen in images or Floor Plans. Add a railing on all the divider lines except where your gate will be. To do this, click Select, click on a divider line to select it, and then click Railing on the right. If you need more detailed steps on how to add a railing, see Add Fences and Railings in Create a 3D Site Plan. Now add the gate. Open Furniture mode and search for Garden Gate. Click or tap to select a gate, and click to place the gate onto the plan. Drag and drop it into place, and use the straight arrows or the Properties pane to adjust the size. Tip: Remember, as a Pro Subscriber, you can Replace Materials on the gates for a more custom look. Take a snapshot to see your new gate.